Four minutes into the first game of the 2017 season, Caitlyn O’Neal, a senior, attacked the basket and was hit by a defender, tearing her anterior cruciate ligament, or ACL. As painful as the injury was for Caitlyn, it was also hard for her teammate and twin sister, Carley O’Neal. After all, the girls had been playing basketball together their entire lives. Last year, with Caitlyn O’Neal’s ACL tear, other player’s injuries and seven first-years playing, GC struggled to win games. Carley led the Maple Leafs to the best of her ability, but she missed her sister on the court. 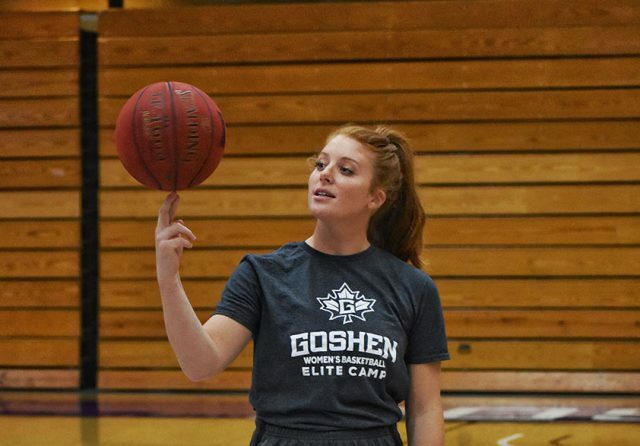 While Carley graduated in April of last year, Caitlyn is back at GC for her fourth season. The two sisters are now swapping roles. This year, Carley is attending grad school at Indiana State University, studying to become a physical therapist. Caitlyn believes that watching her sister play without her all year has helped mentally prepare her for playing without her sister. This season, nobody is happier to see Caitlyn back on the court than her sister. To recover, Caitlyn did physical therapy three to four times per day, every day, for eight months. What motivated Caitlyn was the hope of coming back full-force this season. For the last three months, she has continued to do therapy at least once or twice a day. And even with her injury, Caitlyn continued to work on skills like form shooting and stationary ball handling. Once she was medically cleared, she dedicated a lot of her time to agility work and making her legs stronger. After putting in hours of hard work, she hopes it will pay off on the court. Caitlyn’s main goal is to be able to contribute to GC’s conference games starting in November. However, If the season doesn’t go as planned and her injury doesn’t allow her to see the floor again, she knows that she’ll still be helping her team win through her leadership and encouragement. On the floor or not, her teammates are excited to have Caitlyn back. Kim and Darrin O’Neal, the sisters’ parents, sympathized with their daughters, knowing how hard last year was for them. They too will be cheering from the stands this season. The GC team is confident that they’ll improve over last season. With Caitlyn as a captain, leading the team alongside fellow seniors Sydney Stein and Haley Archibeque, there is a lot of passion in GC’s locker room. Caitlyn, despite her setbacks, is confident in her team.